After we ride a motorcycle for awhile, it always seems as though we are looking for gear that can do more! 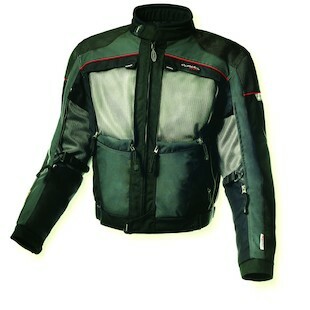 Most riders that call or e-mail us here at RevZilla want more than just a cold weather jacket. They also want more than just a warm weather jacket. That question can go a number of directions, however, and Olympia is here to give an answer. The Olympia Expedition Jacket is true four season, all weather riding jacket, and has replaced the Nomad Jacket as part of the Transition Gear Line. 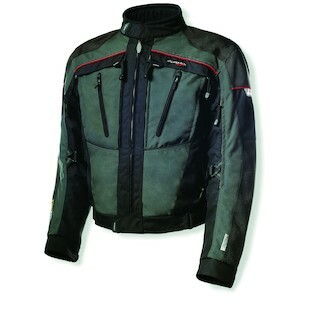 The outer shell of the jacket is constructed of 500 and 2000 denier Cordura fabric for maximum abrasion resistance. There are a few really nice upgrades from the Nomad as well, such as a longer drop back tail section for sport / sport touring riders, a helmet hood and neck gaiter to keep you dry and warm, and a single flap on the rear panels for excellent ventilation. The arms, chest and back feature zip down panels that can be folded away into self-storage pockets instead of having to remove them from the jacket and storing them elsewhere. Once the YKK Zippers are pulled down, the jacket has what Olympia refers to as the Mega Vent Panel System, which, with the liners removed, allows air to flow through the mesh lining and keep you cool on those really hot days. The three layer design featured in the Expedition allows the ability to wear the rain layer either over or under the outer shell of the jacket depending on the weather conditions. Dual sport, touring and street riders all know that getting caught in the rain is inevitable, so this is a great feature. In addition to the rain layer, the Expedition features a removable full sleeve thermal layer. Both the rain liner and the thermal liner are easily removed and installed with zippers. Basically, Olympia has designed this to be a do-all, go-anywhere, trek the world kind of motorcycle jacket. If you are up for the adventure, and have the metal to test yourself at the extreme, check out the Expedition jacket and see where the road takes you.